James Spann has the Alabama forecast to kick off the work week from Alabama NewsCenter on Vimeo. COOL, DRY DAY AHEAD: A few spots have dipped into the upper 30s early this morning; our Skywatcher at Black Creek, just northeast of Gadsden, reported 37 degrees just before daybreak. It was also 37 at Cullman and Haleyville; most places are in the low to mid 40s. 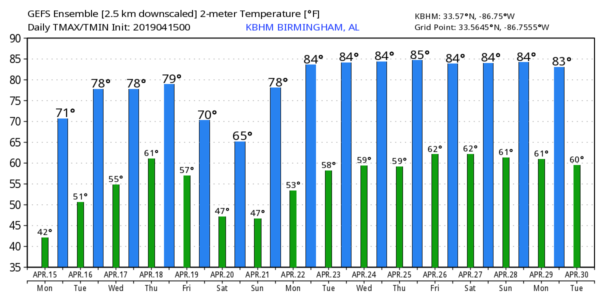 Today will feature sunshine in full supply with a high between 68 and 71 degrees (the average high for April 15 at Birmingham is 74). TUESDAY/WEDNESDAY: Sunny weather continues with warmer afternoons; the high will be close to 80 Tuesday, followed by low 80s Wednesday. To the west, severe storms are likely Wednesday in a broad zone from Texas to near Chicago ahead of another vigorous spring storm system. ANOTHER SEVERE WEATHER THREAT: That system will bring rain and storms to Alabama Thursday afternoon and Thursday night, and the Storm Prediction Center has all of Alabama and Mississippi in a severe weather threat. At this point, it looks like the greatest chance of severe weather for our state will come from roughly 2 p.m. until midnight Thursday — unfortunately, at a time when the air tends to be most unstable. The synoptic setup suggests all modes of severe weather will be possible, including large hail, damaging winds and a few tornadoes. The timing could change as we get closer to the event, but Alabamians will need to be ready for another rough ride Thursday afternoon and Thursday night. FRIDAY: The severe weather threat will move off to the east, but a deep upper trough will keep the sky cloudy with a chance of some lingering rain at times. And the day will be much cooler, with temperatures struggling to reach the low 60s. THE ALABAMA WEEKEND: Any lingering clouds should move out early in the day. Otherwise Saturday will be a sunny, pleasant day with a high around 70. Sunday will feature sunshine in full supply with a high close to 80 degrees. NEXT WEEK: For now much of the week looks warm and dry, with highs most days in the low to mid 80s.